The Monk Nil of Stolobensk reposed on 7 December 1554 (the account about his life is located under this day). Many years afterwards, on the Island of Lake Seliger, where the holy ascetic had asceticised, there came the priest-monk German and immediately after him the hill-dweller and wanderer Boris. They settled together on the island and built a church in honour of the Theophany, with a chapel in the name of Saint Vasilii (Basil) the Moscow Wonderworker. At this site where the Monk Nil had asceticised there in time grew up a monastery, named after him. 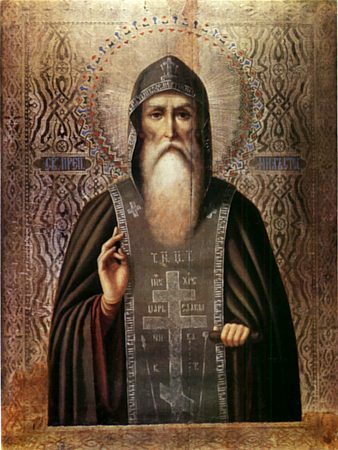 An icon of the Monk Nil was written by the monks of the Orshin monastery, and numerous miracles of healings of the sick began to occur at the gravesite of the saint. Later at the monastery lived Sainted Nektarii, Archbishop of Sibirsk and Tobol'sk, and he decided to build a stone church to replace the former wooden one. During the time of the laying of the foundations, the earth crumbled away and revealed the incorrupt relics of the Monk Nil. The Uncovering of the Relics occurred on 27 May 1667, and simultaneously with this was established a feastday to the monk in honour of the event.